Description: Nerdy genius Techno lives alone in his underground complex, since his grandfather has told him the outside world was dangerous. And he's happy--until he sees the love of his life on a security monitor. 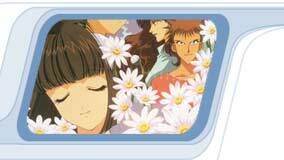 Classmate Hitomi becomes the object of his affection, and obsession, as he uses everything and anything to try and win the heart of his beloved "Daisy." There's just one problem: she doesn't want to have anything to do with him. Can science help Techno win Daisy's love? He's going to need all the help he can get. Don't Leave Me Alone Daisy is a fun-filled comedy pseudo-romance, recommended. When Techno spots Hitomi, it's love at first sight. Techno decides she should be called "Daisy," and he uses all his genius as a teenage mad-scientist inventor to try to take possession of "Daisy," to arrange opportunities to be with Daisy, to impress Daisy, and to get rid of supposed rivals for Daisy. Robots, heat rays, surveillance machines, antigravity devices, invisibility shields, enlarging rays, sentient nuclear missiles- this is just the beginning of Techno's arsenal, and they all backfire with comic effect. In one sequence, Techno sends away a "rival" by locking an electronic shock device onto the boy's wrist. The device activates if it gets too far from the remote control unit. Techno then puts the control unit on a cat's collar and sets the cat to chasing an antigravitional catnip container. Hitomi/Daisy is appalled and flabbergasted by all this. But she might actually be interested in the good-looking and sincere Techno if he started acting like a human being. Alot of the plot is... er... unrealistic to say the least(his best friend is a missile?!?!) but at the same time I suppose its the absurdity of the plot that makes alot of things that would normally be quite offensive seem okay. Even the character of Techno seems okay when you realize he's just a super-genius teenager who's been shut away from society his whole life and has alot to learn. This show isn't for everybody and it does leave alot to be desired. However, if you just want something to keep you busy on a rainy afternoon and you aren't *too* easily offended, you may wanna pick this up. If anything you'll feel alot better about the state of today's youth when you realize that Techno doesn't actually exist in real life..... and thank goodness for that.